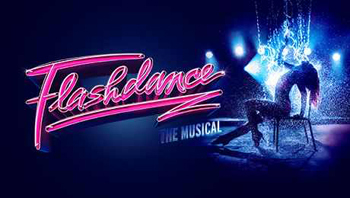 Words like crowd-pleasing, feel-good and upbeat truly have found their home with this latest touring production of Flashdance, the Musical based on the popular 1980s film of the same name. Co-produced by Selladoor Productions, David Hutchkinson, Phillip Rowntree and Runaway Entertainment in association with Jason-Haigh-Ellery, Richard Darbourne Ltd and Matthew Cundy Productions, this show has some heavyweight names behind it. The film's (and the Musical's) somewhat cult popularity combined with it casting household names for the leads, more or less ensures this show's success. The book, by Tom Hedley and Robert Cary stays true to the film. In Somewhereville, USA, lives and works a beautiful and feisty young woman. By day a welder in a steel factory, but by night a dancer in a bar. She dreams of dancing, and looks on in awe at the local prestigious dancing academy. Her boss at the steel plant has eyes for her, and although they are at first obvious enemies, they become friends, allies and lovers. Between him and her old friend and ex ballet teacher Hannah, she renews her conviction to audition for the school, and of course does eventually fulfil her dreams. I found this production however very Curate's Eggish (good in parts). For a touring production of this stature some things were very predictable. However, I was pleasantly surprised by the presence of a live 5-piece band. My euphoria in this regard though soon waned when the conductor failed to wait for the end of dialogue before bringing the music in and consequently a couple of starts of the songs were out of sync. I looked but could not see any useful monitor between cast and band, and since the band were positioned behind the action, then this should have been a prerequisite and of primary importance. The set, designed by Taxis, and the lighting, designed by Andrew Ellis, were for me the worst elements of this show. A minimalist set comprising of two staircases and two flats with a small platform atop and each with three reversible panels served the basis of all the scenes. I hated to see cast, especially principals, moving these and other smaller items ad nauseam, and for me simply did not convey the mood or the setting for this show at all. I also found the lighting was both distracting and focus-taking. I was once told that if the lighting in a production is noticeable, then it is either wrong or deliberately masking something else; perhaps tonight it was both. However, what was extremely praiseworthy and undoubtedly the 'star' of the show, was the dancing. Matt Cole choreographed some lovely, and indeed exhilarating and exciting routines which were all period correct and fantastic to watch, and I was in awe that they were able to keep this energy up for such a long time whilst singing and acting at the same time. Joanne Clifton, star of Strictly Come Dancing and last seen by this reviewer in a totally different guise as the title role in the tour of Thoroughly Modern Mille, played the lead role of Alex with genuine sensitivity and skill. A truly powerful performance which suited her skills excellently. Playing opposite her was another household name, lead singer of boyband A1 and writer of current sell-out London hit, Eugenius!, was Ben Adams as Nick Hurley. Sadly I found Adams's performance rather stiff and unemotional and didn't believe his love for Alex or his passion to save the workers. It felt like he was only running on half power this evening and his voice a little too weak to compete with powerhouse Clifton. All the smaller principal roles impressed; however a couple are worthy of a special mention here. First was Hollie-Ann Lowe's excellently measured descent into drugs and prostitution as Gloria; and two characters whom I did not like at first, but taking their performances as a whole in retrospect I completely understand them and appreciate them all the more. They were Rikki Chamberlain's Harry and Colin Kiyani's Jimmy. Overall a highly energetic modern Cinderella story which will leave you breathless just watching it.